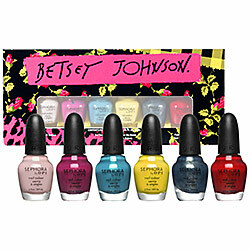 The New Betsey Johnson Nail Polish Collection! If you have read my blog before, you may know I absolutely LOVE Betsey Johnson. She is one of my absolute favorite fashion designers (read the post I wrote HERE about her show at NYFW). From her bright colors to her outrageous prints, her party dresses & other clothes/accessories embody everything that is wonderful about being a girl: glitter, sparkles and PINK! So knowing my love for Betsey Johnson, I was SO excited to hear that Sephora by OPI was releasing a Betsey Johnson nail polish line that includes not only ADORABLE nail polish shades but also nail polish lacquer strips in cute patterns! Today before my nail appointment I decided to run in Sephora & was definitely overwhelmed at the wide selection of polish shades to choose from. There were individual bottles for $9.50 each and then a mini set of 6 polishes (pictured above) for $24.50. However what caught my attention the most was the hot pink shade called “It’s My Pink!” that is also….wait for it…. SCENTED!!!! You heard me right….SCENTED nail polish!!! The polished is infused with a fragrance from Betsey Johnson’s perfume called “Too Too.” So of course I had to pick that up for my toes…. Even the packaging for the Betsey Johnson nail polish is adorbs! For my nails, I decided I would branch out and get a set of the nail lacquer strips. If you’re not familiar, nail polish strips are literally just “stickers” you apply to your nails that have fun patterns, colors, etc and can be taken off with nail polish remover. There were 3 patterns (cheetah, skulls & lips) available in the Betsey Johnson line ($12 for a set) but of COURSE I HAD to get the hot pink cheetah print. Can you say TO DIE FOR!? So with Betsey Johnson nail polish products ready I went to my nail appointment prepared to leave with some FABULOUS nails but first I decided to send out a Tweet discussing my recent Betsey Johnson nail product purchases. And guess who replied to my tweet?!?! That’s right….the one and only Betsey Johnson herself!!!! If you don't already be sure to follow me on Twitter @AshLovesFashion! My Twitter conversation with Betsey Johnson!!! Love her! If you're not familiar with Twitter, read from the bottom (starting with my Tweet) up. So I wasn’t sure exactly how the nail polish strips would work but my nail technician is AMAZING and figured it out!!! The packet comes with 16 different sizes of nail polish strips so you can find the correct size for your nail. Once she applied the strip, she smoothed it out to remove any air bubbles. We then cut off most of the excess and filed the rest. One of the best parts is that you don’t have to wait for them to dry!!! Here is how they turned out…. OPI for Sephora Betsey Johnson trend tips...hot pink cheetah print! "It's My Pink!" Betsey Johnson nail polish! Make sure you check out the whole collection by clicking HERE and scrolling down the page to see all the products!!! So will you be or have you tried any of the Betsey Johnson Sephora by OPI collection!? Leave me a comment & let me know what you think!!! Thank you so much for reading gorgeous dolls! It’s almost Friday…YAY! Saturday Fashion Inspiration: Coral Jeans! New Beauty Obsession: Bath Junkie! "My Favorite Color Is Neon...."